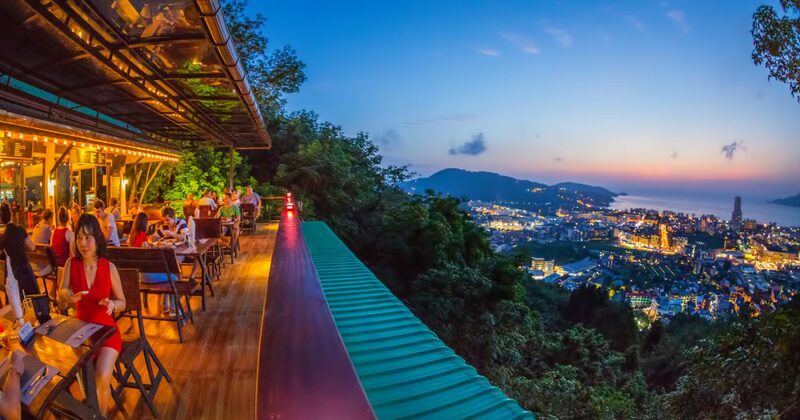 Patong Sunset View Restaurant is a great spot to end the day with a nice dinner or even just a drink while enjoying one of Phuket famous sunsets. The restaurant is relatively small but the terrace can welcome quite a few guests and everything is very affordable. 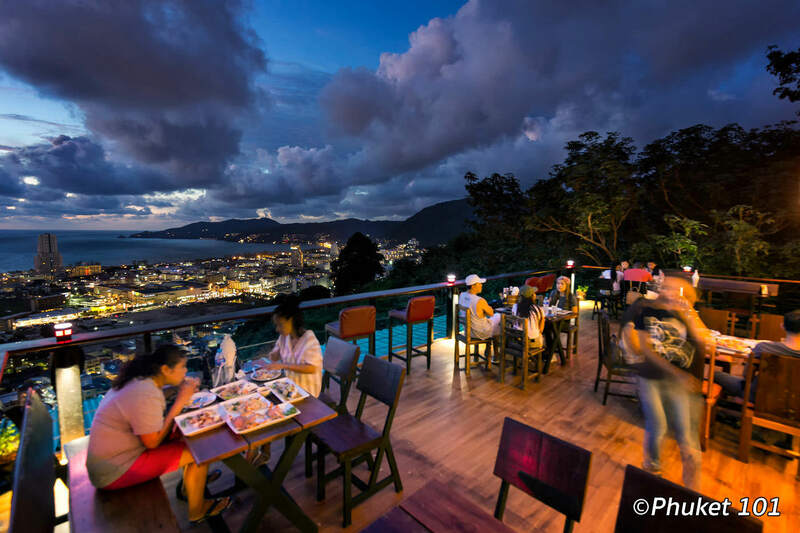 To make the best of your dinner, you should really sit at the front of the balcony to enjoy the panoramic view of Patong beach. 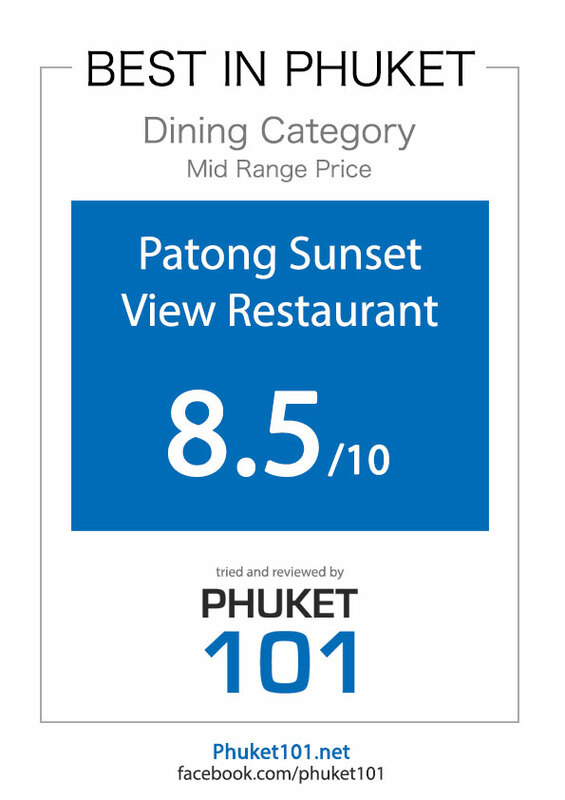 Considering the growing popularity of Patong Sunset View Restaurant, we really recommend you to call early and book in advance by calling 087 887 8039. From up there you can recognize instantly the immense Jungceylon Shopping mall and the tall tower of the Royal Paradise Hotel. 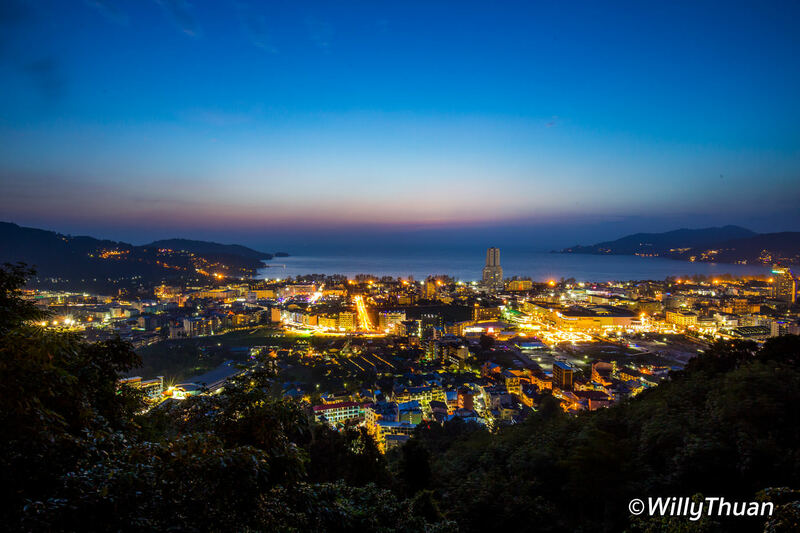 The rest is all yours to discover and test your knowledge of Patong from the top. 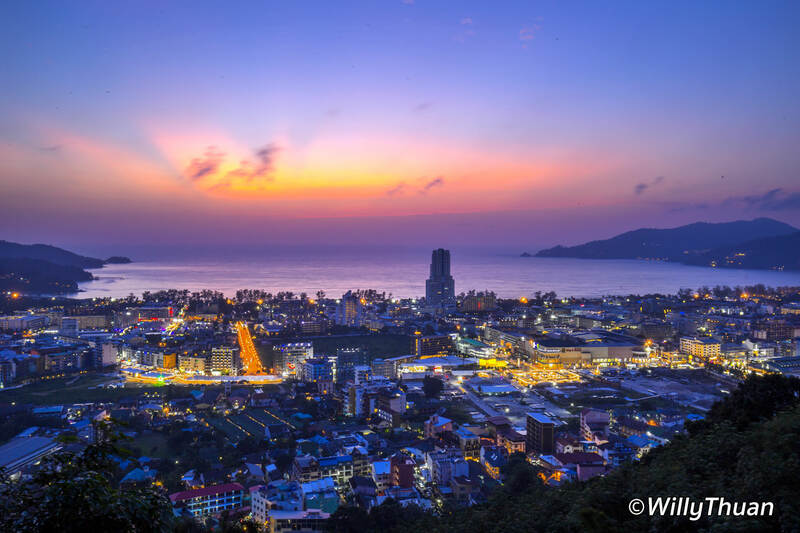 Beyond the city, you can admire the bay of Patong with the never-ending ballet of parasailing and the sun slowly descending on the ocean. 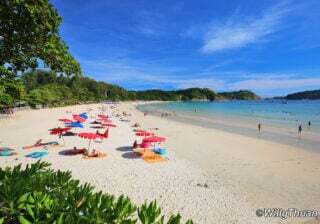 If you are on a lucky day, you will get one of those amazing sunsets Phuket is really good at. Interestingly, raining season dramatic cloudscape offers better sunsets than the empty blue skies of high season. 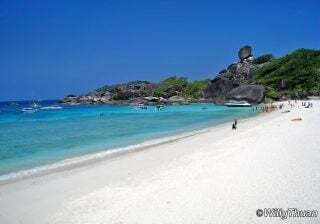 No matter when you come to Phuket, it’s always worth going up there and enjoy the views. We came early and enjoyed a couple of drinks on the terrace while chatting and taking photos. 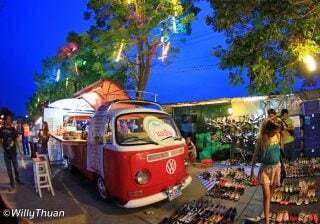 We had plenty of time and prices are so cheap: a beer is only 79 baht! A soft drink is 49 baht and all cocktails are around 160 baht! Once the sun had set and we had all our photos taken, it was time for us to enjoy dinner. 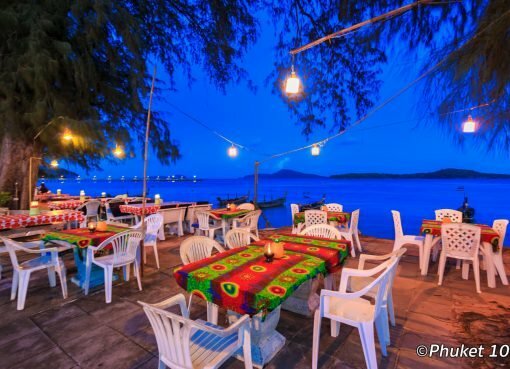 Patong Sunset View Restaurant serves a mix of Thai and European cuisine. 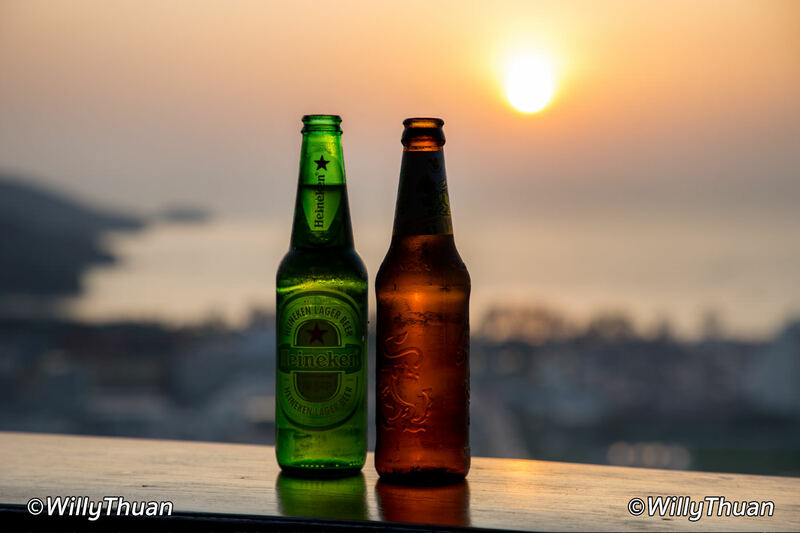 We started with some chicken wings, springs rolls and chicken satay all at 110 baht… always seem to go well with sunset and beers. As a main we had a pork chop with fries (299 baht) and really good BBQ pork Ribs (350 Baht). 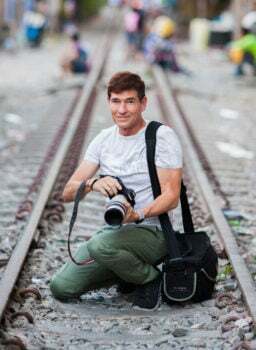 You can enjoy Thai food as well: a fried rice with chicken is 110 baht, a chicken cashew nuts 139 baht and that famous Tom Yum Koong (Prawns) is 149 baht. The list goes on and everyone should have a good time. 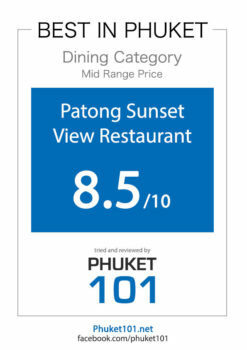 Overall it was a perfect sunset casual dinner in Patong and we would recommend it without hesitation. Great view, right price and a really nice friendly team (speaking good English) who makes sure your dinner is going smoothly. How ratings work: Our ratings are based on quality, food, setting, service and price – We pay for our meals and our stays, and we come unannounced.